I really enjoyed this tale of romance between the unlikely couple, Clara and Captain Blackheart. The captain isn't as fearsome as his name suggests. His character comes across very well early in the story when he finds Clara ill and isolated at her home in America. He can be a little bit gruff but he proves to be quite gentlemanly, heroic and has a nice sense of humour. He takes good care of Clara who is very ill at the beginning of the story and he deposits her safely at her parent's doorstep as promised. A reader unfamiliar with previous titles in the series might find Clara's reunion with her parents, after so many years apart, to be resolved at breakneck speed and without much elaboration. You really need to read her daughter, Grace's story, in 'The Earl's Defiant Wallflower,' to enjoy the complete picture. 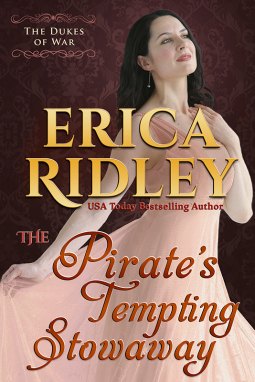 The Pirate's Tempting Stowaway is a fast paced, humorous, romantic story that will take you away for a few delightfully escapist hours.